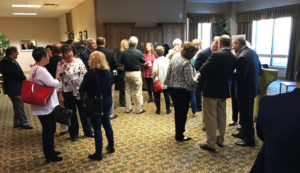 Rotary District 7545 PETS Graduation Ceremony, Saturday, March 16, 2019 in Flatwoods, West Virginia. District Governor-Elect, Shari Messinger stands behind the graduates. 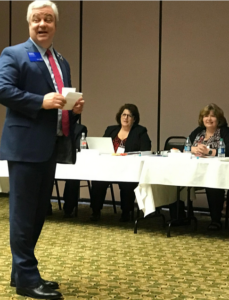 RI Director David Stovall and PDG Kim Waters opened the 2019 PETS Session on Friday. 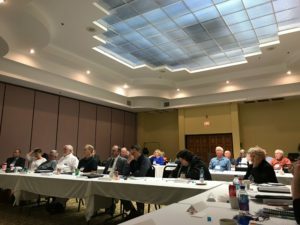 March 15, 2019 – Nearly 70 Rotarians from 55 clubs that will comprise the new District 7545 in West Virginia attended the West Virginia PETS, held the weekend of March 15 and 16. The Presidents-Elect Training Seminar (PETS) is Rotary’s training program for club Presidents-elect and Assistant Governors. The goal of PETS is to prepare Presidents-elect and Assistant Governors for their upcoming roles in the coming Rotary year. How? Through provocative plenary speakers, in-depth breakout sessions, discussions with peers from various clubs, and informal fellowship and networking with other Rotarians, new club leaders learn basic leadership skills to use throughout the new Rotary year that begins July 1. 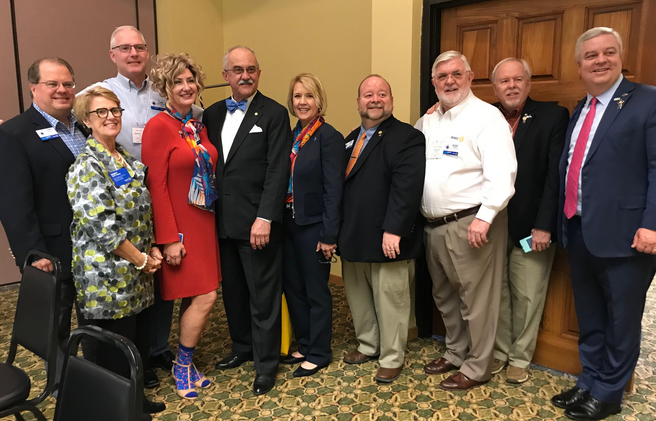 In November 2018, Rotary International made the decision to combine District 7530 (northern West Virginia) and District 7550 (southern West Virginia), bringing over 2,200 Rotarians under one District – D7545. This year’s PETS was a collaborative effort of the new Rotary District 7545 which now includes 55 clubs from 47 West Virginia counties. Rotary International Director (RID) David Stovall traveled to Flatwoods from the Rotary Club of Hall County, Georgia to open the two-day event, speaking to the group on the importance of working together to connect the two districts into one larger and more effective Rotary district to help West Virginia communities. Speaker PDG Kim Waters, accompanying Stovall, stressed that it is vital for all club presidents to serve their club members first. 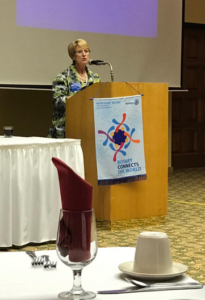 Regional Rotary Foundation Coordinator, Nancy Barbee. 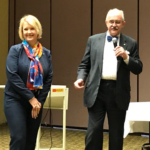 The afternoon session included an overview of the 2019-2020 Rotary International Presidential Citation and a unique networking activity guided by PDG and District Trainer Terry Mathias from the Rotary Club of Chaleston Vandalia. The day session ended with Zone 33 Regional Coordinator, Patrick Eakes offering to the group applicable membership strategies to improve clubs and service within the community. After cocktail hour and music by Elkins-based Seth Maynard, a member of the West Virginia Jazz Society, the group gathered for dinner to listen to a compelling and passionate story about the global effectiveness of Rotary and how thinking globally can change a life anywhere in the world, whether it be in this country or abroad. Regional Rotary Foundation Coordinator (RRFC), Nancy Barbee from District 7730 in North Carolina led the group through her life of learning about Rotary and how she learned about The Rotary Foundation, the funding arm of Rotary that fuels humanitarian projects throughout the world, including the eradication of Polio worldwide. Since 1985 Rotary members have helped immunize more than 2.5 billion children against polio. As of June 2018, Rotary had spent more than $1.8 billion toward global polio eradication, seeking to eliminate the virus in the last three countries where it remains endemic and to ensure that it does not return elsewhere. (Left to Right) PDG 7550 and District Trainer Terry Mathias, Regional Rotary Foundation Coordinator (RRFC) Nancy Barbee, D7545 DGN-D (2021-2022) David “Coop” Cooper, D7545 DGE Shari Messinger, RI Director David Stovall, PDG Kim Waters, D7545 DGN Sean Jeffrey Sawyer (2020-2021), D7545 DGN-DE Roger Topping (2022-2023), D7530 DG Mike Davidson and Zone 33 Regional Coordinator Patrick Eakes. Saturday training convened with three breakout sessions covering important Rotary topics: The Rotary Foundation, Membership Strategies and Public Image. 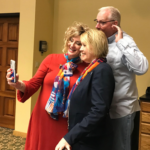 The Saturday schedule culminated with a parting speech by District Governor-Elect, Shari Messinger of the Rotary Club of Barboursville, who will begin her governorship on July 1, 2019. A graduation ceremony closed out the weekend event with the distribution to each candidate a flag signifying the coming new Rotary year. District 7545 will be one of 529 districts worldwide that make up Rotary International, a humanitarian, service-oriented organization that encompasses over 1.1 million members. Rotarians provide service to others, promote integrity, and advance world understanding, goodwill, and peace through fellowship of business, professional and community leaders. For more information on the new Rotary district, visit Facebook at Rotary District 7545. A new website created by Rotarians Mark and Bonnie Branciaroli, RotaryDistrict7545.org will launch on July 1, 2019. DGE 2019/2020 for the new District 7545, Shari Messinger, has announced a new date and location for Mountaineer PETS. The new date is March 15 and 16, 2019. The Mountaineer PETS will be held at the Days Inn Suites & Conference Center in Flatwoods, WV. Those who need to attend are President Elects, Assistant Governors, Committee Chair and those who will hold any District office. Any Rotarian who would like to learn more about Rotary is welcome to attend. This will be a combined PETS for both Districts 7530 and 7550. More info will be shared at a later date. Directions to Days Inn, Flatwoods. For more detailed information, here is the PETS 2019 Newsletter emailed March 4, 2019 which includes registration information and the agenda.